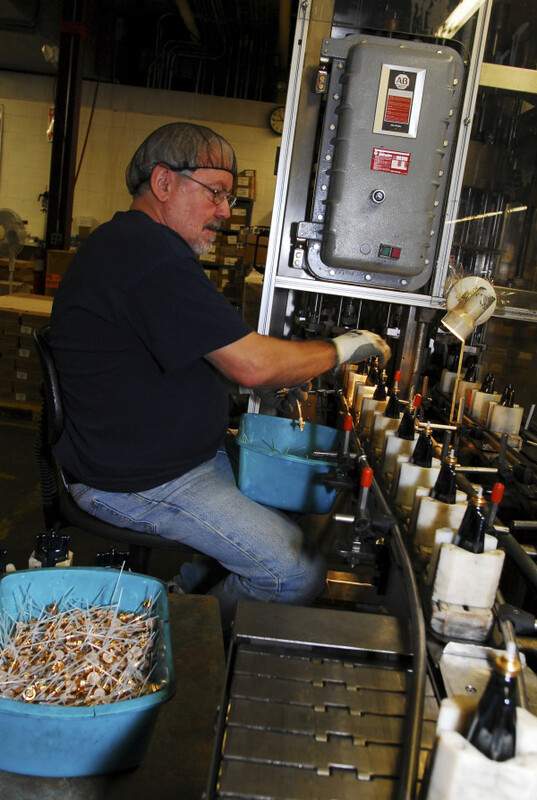 Bob Bourgoin inserts pumps into a line of perfume bottles at Evergreen Manufacturing in Madawaska in this December 2010 file photo. MADAWASKA, Maine — The perfume maker Evergreen Manufacturing plans to close by the end of the month, laying off 70 employees after the loss of its primary contract with the international cosmetics brand Elizabeth Arden. In a successful filing requesting federal work transition help for the company’s employees, plant manager Laurie Gagnon wrote that the company’s contract with Elizabeth Arden made up about 95 percent of its business. Elizabeth Arden, which saw international sales decline by about 11 percent during its fiscal year ended June 30, 2015, said in its most recent annual report that it had chosen to lower sales in China as part of a new distribution strategy. Ryan Pelletier, Madawaska’s town manager, wrote in an email that town officials have met with the company about developing a marketing video for the facility and exploring potential leads for new investment. The company filed its petition with the U.S. Department of Labor on behalf of all of its 70 employees in late February. Pelletier said the company was not limited only to options in the cosmetics field, but he did not know the status of that search for a new client. In 2010, the company was in talks with a pharmaceutical company to bottle and package its product. The company was restarted in 1999 when owner Jeff Albert bought it out of bankruptcy, with a headcount of less than 20. By 2010, the company had grown into a $20 million business with 70 employees. In its petition for federal Trade Adjustment Assistance, Gagnon wrote the planned closure date for the facility was June 30, 2016. That petition was approved May 26. The program requires a finding that the layoffs were primarily because of foreign competition. The Trade Adjustment Assistance program helps fund job retraining and provides wage subsidies, which can for a period of time bridge the gap between what a person was earning and what they make at a new job.